HARD working three-piece, The Amorettes, have earned their stripes on the road, with solo shows and support slots with the likes of Danko Jones and Europe to name but a few. Most recently they had a Download slot when they had a chance to air some new tunes. 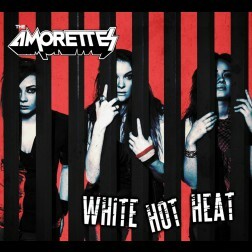 Those tunes have emerged like a slick snake of fun from their release on Off Yer Rocka of the album 'White Hot Heat'. And, what an album it is! This is a collection of 10 tunes that put you in the mood to party, grab a beer and get set for one mad night out. Those hard hours on the road have been captured in the studio by Thunder's Luke Morley who rests the best from Hannah, Heather and Gill. Bursting with energy, riffs, licks and infectious melodies this is an album that shows that the band have evolved into a mean hard rock machine. 'Come 'n' Get It' moves the songs along at a blistering pace after the openers set the mood, especially the party anthem 'Let The Neighbours Call The Cops'. This has the sound of late 70s, early 80s rock - as if Suzi Quatro, Joan Jett and Lita Ford were thrust into 2016 and given a shed load of good drugs. But this isn't generic. On first listen there may be a temptation to just nod away, but soon the feet are tapping, and the smile on your face grows wider. There is no one fixed tempo, no song when you can just put the band into a single frame of reference. The mood is changed up on 'Pervert Alert' with it's middle finger to lecherous males and misogyny. 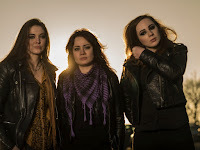 What is clear from every song is that 'The Amorettes' pen great tunes, play with a sense of enjoying what they do, and just get their heads down to the hard work. Morley's production, and Nick Brine's work on engineering and mixing may be an important factor in the sound on this release, but you can't work studio miracles on a rock album if the raw material isn't really good in the first place, and no miracles were required here. 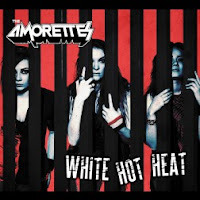 The Amorettes have the sense and sensibility to know that they're not re-inventing rock 'n' roll, but are instead adhering to its essential spirit, distilling that unique drum, bass and guitar formula into a fiery liqueur that will blister your throat with each delicious sip you can take. Party? Yes, I think we shall with 'White Hot Heat'.